Over the past year or so, we’ve had the chance to sit down with over one hundred amazing founders, investors and experts to chat about all aspects of startup life. Ranging from the earliest of days in a company’s journey to scaling up and eventually exiting their companies, we’ve explored and been fortunate to share the journey of what many of our friends know through their experience. When I started the podcast, the idea was to get behind the person’s achievements and to really understand how their early struggles helped get them the experience they were sharing. The theory is, that by understanding someone’s struggles, you can understand their achievements and learnings… and to this end, we feel we’ve achieved what we set out to do. As with all projects, however, evolution is necessary. Having learned from our interviews to date, we are committed to finding amazing and knowledgeable people who can share what they know with us so we can learn collectively. We will also increasingly dive into discussions around functional topics and sectors to provide listeners with a deep-dive into hot topics from leading voices in the field. Over the past year, we’ve also been creating curated playlists for those of you who want to learn more about a specific topic as well as for those of you who want to just better understand functional roles (such as sales or marketing or product development) and the role they can play in your business. 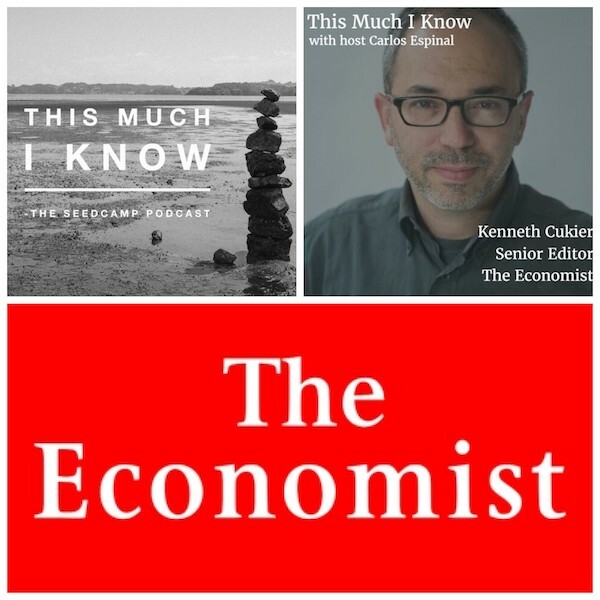 As part of this evolution, I’m happy to embrace the title of our new podcast — ‘This much I know’ — where we look forward to sharing the inside story from founders, investors and leading tech voices; the people who’ve built businesses, scaled globally, failed fantastically and learnt massively. This Much I know summarizes not just what our guests share but hopefully what collectively, as a community, we can provide to further our own knowledge from those who’ve been there, done that and, most importantly, survived to tell the tale. We look forward to bringing you even more content in 2017 and, as ever, we’d love to hear your feedback. So, if there’s a topic area you’d like us to explore, a founder story you’re keen to discover or a personal story you’d love to share, please get in touch… and now onto who our first guest of the year was! Big data, argues Kenneth Cukier, senior editor for data and digital at The Economist, is epoch defining: the ability for humans to store and transmit information at a scale previously inconceivable will transform ‘how we work, live and think’ — much as fire, bronze and the paper press revolutionized earlier societies. But how should we respond to the economic dislocation AI will produce in conjunction with big data? Kenneth’s career in journalism is a distinguished one. The co-author of the New York Times Best Seller “Big Data” (2013) he manages new digital product development and oversees data analytics for The Economist. Prior to this, Kenneth served as technology editor of the Wall Street Journal Asia and also worked at the International Herald Tribune in Paris. In 2002–04 he was a research fellow at Harvard’s Kennedy School of Government. During our chat, Kenneth shared that information has gone from ‘a stock to flow’. Instead of being stored in fixed media — such as clay discs 4,000 years ago — data is now liquid and dynamic. The application of machine learning techniques and algorithms to such data lets us do things once impossible, such as build self-driving cars or diagnose diseases at a far earlier stage. But, he cautions, ‘it is the mark of an unwise society’ and close to criminal that we are not properly sharing data in spheres such as healthcare. Take a Listen to understand how we can learn from the information we collect, what change needs to materialize before we feel AI’s effect in proper, and how to respond to the job displacement that AI will bring about.